Red-line extensions start with custom 32 millimeter, 6061 T-8 “drawn” aluminum tubing. The kind of tubing they use to make aircraft. Our tubing is engineered so that with its large diameter, the wall thickness can be thinner so the overall result is an incredible high strength, to low weight ratio. This formula has been proven with our years of experience. 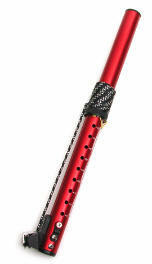 The holes are precision punched, then the tube is red anodized in and out, permanent laser numbered 2 centimeter settings. The adjustment settings are held with a hard anodized aluminum collar tethered with a spectra line to a stainless steel pin. Fail-safe and virtually break proof. Finally we attach our new beefy “Power-Six” super powerful 6:1 downhaul cleat with large diameter pulleys, perpendicular for power, easy rigging and no crossed lines. An 8-plait, pre-stretch downhaul line is included. Retail - $115.45 Sale Price - $98.96 Unfortunately, it appears STREAMLINE has gone OUT OF BUSINESS. Red-line extensions start with custom 32 millimeter diameter, 6061 T-8 “drawn” aluminum tubing. The kind of tubing they use to make aircraft. Our tubing is engineered so that with its large diameter, the wall thickness can be thinner so the overall result is an incredible high strength, to low weight ratio. This formula has been proven with our years of experience. The holes are precision punched, then the tube is red anodized in and out, permanent laser numbered 2 centimeter settings. The adjustment settings are held with a hard anodized aluminum collar tethered with a spectra line to a stainless steel pin. Fail-safe and virtually break proof. Finally we attach our new beefy “Power-Six” super powerful 6:1 downhaul cleat with large diameter pulleys perpendicular for power, easy rigging and no crossed lines. An 8-plait, pre-stretch downhaul line is included. Our mechanism that secures onto your Euro pin base is made with precision stainless steel parts and spring. It is easy to use and secure. Streamlined is the only Euro pin system that includes a secondary latch guaranteeing a sure connection [the latch will not set if there is a connection problem like sand] as well as protecting against unwanted disconnections. Our mechanism that secures onto your Euro pin base is made with precision stainless steel parts and spring. It is easy to use and secure. Streamlined is the only Euro pin system that includes a secondary latch guaranteeing a sure connection [the latch will not set if there is a connection problem such as sand] as well as protecting against unwanted disconnections. Retail - $129.68 Sale Price - $111.15 Unfortunately, it appears STREAMLINE has gone OUT OF BUSINESS. This is another ground breaking design from Streamlined. This extension is all small diameter, strictly for RDM and Euro pin connection. This is the first real RDM extension. It is clean, simple and strong. When you rig your "Reduced Diameter Mast" with this extension and our strictly RDM boom head you will have a complete RDM rig. These Red-line extensions start with 32.5 millimeter diameter, 6061 T-8 “drawn” aluminum tubing. . Our tubing is engineered so that with its perfect diameter and wall thickness you get incredible high strength, to low weight ratio. This formula has been proven with our years of experience. The holes are precision punched, then the tube is red anodized in and out, permanent laser numbered at 2 centimeter settings. The adjustment settings are held with a hard anodized aluminum collar tethered with a spectra line to a stainless steel pin. Fail-safe and virtually break proof. Finally we attach our new beefy “Power-Six” super powerful 6:1 downhaul cleat with large diameter pulleys perpendicular for power, easy rigging and no crossed lines. An 8-plait, pre-stretch downhaul line is included. Our mechanism that secures onto your Euro pin base is made with precision stainless steel parts and spring. It is easy to use and secure. Streamlined extensions have the only Euro pin system that includes a secondary latch guaranteeing a sure connection [the latch will not set if there is a connection problem such as sand] as well as that it protects against unwanted disconnections. This is another ground breaking design from Streamlined. This extension is all small diameter, strictly for RDM and Euro pin connection. This is the first real RDM extension. It is clean, simple and strong. When you rig with your "rReduced Diameter Mast", this extension and our strictly RDM boom head you will have a complete RDM rig. These Red-line extensions start with 32.5 millimeter diameter, 6061 T-8 “drawn” aluminum tubing. . Our tubing is engineered so that with its perfect diameter and wall thickness you get incredible high strength, to low weight ratio. This formula has been proven with our years of experience. 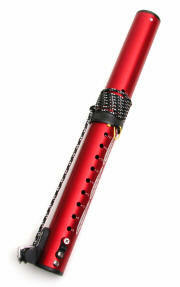 The holes are precision punched, then the tube is red anodized in and out, permanent laser numbered 2 centimeter settings. The adjustment settings are held with a hard anodized aluminum collar tethered with a spectra line to a stainless steel pin. Fail-safe and virtually break proof. Finally we attach our new beefy “Power-Six” super powerful 6:1 downhaul cleat with large diameter pulleys perpendicular for power, easy rigging and no crossed lines. An 8-plait, pre-stretch downhaul line is included. Our mechanism that secures onto your Euro pin base is made with precision stainless steel parts and spring. It is easy to use and secure. Streamlined extensions have the only Euro pin system that includes a secondary latch guaranteeing a sure connection [the latch will not set if there is a connection problem such as sand] as well as that it protects against unwanted disconnections. Retail - $125.95 Sale Price - $107.96 Unfortunately, it appears STREAMLINE has gone OUT OF BUSINESS. Our new “HMX” pre-preg carbon graphite extensions are light, feather-lite. As far as we know they are the lightest extensions in windsurfing. They have an incredible strength to weight ratio. With our top quality pre-preg carbon fiber material and our meticulous manufacturing process we have developed the strongest, lightest extensions possible. Compare the weight to any other like extension. The 2 centimeter adjustment settings are set with a hard anodized aluminum collar tethered with a spectra line to a stainless steel pin. Fail-safe and virtually break proof . Finally we attach our new beefy “Power-Six” super powerful 6:1 downhaul cleat with large diameter pulleys perpendicular for power, easy rigging and no crossed lines. A tough Dyneema “super downhaul” downhaul line is included. Retail - $173.20 Sale Price - $148.46 Unfortunately, it appears STREAMLINE has gone OUT OF BUSINESS. Our new “HMX” pre-preg carbon graphite extensions are light, feather-lite. As far as we know they are the lightest extensions in windsurfing. An incredible strength to weight ratio.. With our top quality pre-preg carbon fiber material and our meticulous manufacturing process we have developed the strongest, lightest extensions possible. These are almost exactly like our aluminum models 2730 and 2746 but 26% lighter. Compare the weight of our carbon extensions to any other like extensions. The 2 centimeter adjustment settings are set with a hard anodized aluminum collar tethered with a spectra line to a stainless steel pin. Fail-safe and virtually break proof. Finally we attach our new beefy “Power-Six” super powerful 6:1 downhaul cleat with large diameter pulleys perpendicular for power, easy rigging and no crossed lines. A tough Dyneema “super downhaul” downhaul line is included. Our mechanism that secures onto your Euro pin base is made with precision stainless steel parts and spring. It is easy to use and secure. Streamlined extensions have the only Euro pin system that includes a secondary latch guaranteeing a sure connection [the latch will not set if there is a connection problem such as sand or dirt] as well as that it protects against unwanted disconnections. Our new “HMX” pre-preg carbon graphite extensions are light, feather-lite. As far as we know they are the lightest extensions in windsurfing. An incredible strength to weight ratio.. With our top quality pre-preg carbon fiber material and our meticulous manufacturing process we have developed the strongest, lightest extensions possible. These are almost exactly like our aluminum models 2730 and 2746 but 26% lighter. Compare the weight of our carbon extensions to any other like extensions. The 2 centimeter adjustment settings are set with a hard anodized aluminum collar tethered with a spectra line to a stainless steel pin. Fail-safe and virtually break proof. Finally we attach our new beefy “Power-Six” super powerful 6:1 downhaul cleat with large diameter pulleys perpendicular for power, easy rigging and no crossed lines. A tough Dyneema “super downhaul” downhaul line is included. Our mechanism that secures onto your Euro pin base is made with precision stainless steel parts and spring. It is easy to use and secure. Streamlined extensions have the only Euro pin system that includes a secondary latch guaranteeing a sure connection [the latch will not set if there is a connection problem like sand] as well as that it protects against unwanted disconnections. Retail - $162.70 Sale Price - $139.46 Unfortunately, it appears STREAMLINE has gone OUT OF BUSINESS.